My First Printer. What Was Yours? I wanted a printer for school to use with the TI, and one day on the way home from work, my dad stopped in a nondescript office equipment shop and asked about a printer. As I recall, the TP-I had been discontinued in favor of the TP-II, and so dad was able to grab one for a discount. It was mid-1983 when I printed my first page of text with it. The TP-I would not print graphics, being a daisywheel printer, but it produced the highest quality text of any printer I ever owned, save for the HP LaserJet sitting behind me. It didn’t have a cut-sheet feeder or a tractor feed mechanism, and so paper had to be fed into it one sheet at a time. For program listings, I did use tractor feed paper, but it would end up skewed a bit here and there, what with no proper tractor feed mechanism in place. Since then I’ve gone through quite a few printers — just about 20 in all. So, what was your first printer? When did you get it and what system did you use it with? This entry was posted in Other Platform. Bookmark the permalink. 33 Responses to My First Printer. What Was Yours? In my case, it was a Sinclair ZX Printer for my Sinclair Spectrum, which burned a layer of silver off black paper in a rather haphazard manner, but it was fun to use – after printing a listing my bedroom smelled of fire and brimstone! The printers I used for many years after were the Epson LX80 and the Citizen 120D, both excellent dot matrix printers, great workhorses and ideal for program output. I’ve been through loads of different printers since then. These days I mainly use an HP Laserjet 4300DTN, as a writer I find its 45 ppm output a great boon. My first printer was purchased with my Apple //e. It was an ImageWriter. My first printer was an IBM electronic selectric typewriter, interfaced to an Apple //e, and shown here at the extreme right. My first printer was an Apple ImageWriter II, which was hooked up to my Apple IIgs back when I was in junior high. I had a habit of printing out stories I was working on so I could make edits by hand, and I didn’t want to pester my parents for new cartridges all the time, so I improvised by re-inking the ribbon with various black markers — and amazingly enough, it actually worked! As for my first printer, well, it was the Star LC-24. It was a colour dot matrix printer that I believe was only manufactured and sold in Greece. My first printer was a Star LC-10, which we bought for my Commodore C64. I remember buying the C64 for £250, and then a few years later paying the same again for the printer! I have no idea for sure when we had the printer, but it must have been around 1987 (I was only a kid then!). My first “printer” was really more a plotter than anything. It was the Commodore 1520. I believe it was marketed as a “printer/plotter”. 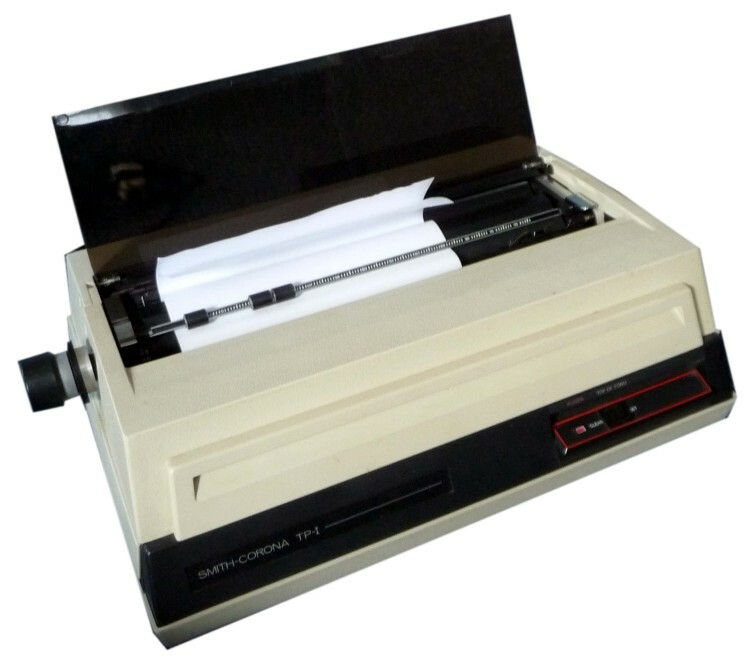 I used it on my Commodore VIC-20, and since I didn’t have any word processing software at the time, I wrote a very generic word processor, and then proceeded to use it to hand in my reports on the very tiny 4.5″ wide rolls of paper! It was better than hand-writing it! Later I upgraded to Laser 128 Apple // compatible, and could then at least save my work and print it out at school on a normal size printer. My first printer was an Apple StyleWriter 1200, connected to my Performa 630. My first personal purchase of a personal computer AND an accessory, in 1996, and quite a hefty amount I paid in consideration of my monthly salary. If I recall correctly, it was 1,500,000 Italian Lire, equivalent to today’s US$1,340 and, back then, about two wages. My first printer was the Okimate 10 color dot matrix printer for my Commodore 64. 30 minutes after setting it up I had probably wasted about half the printer ribbon on the sample printouts, one of which was a scene from “The Hobbit” if I remember correctly. I remember waiting 10-15 minutes for my high school Physics lab reports to print out (using Speedscript word processor which I typed in from Compute’s Gazette using MLX: their assembly language program generator. Long strings of numbers!). Of course the C64 was not a multi-tasking computer so nothing else could be done while on it while it printed. Amazing how far things have come in the past 30 years. Ah, nice. I had two Okimate 20s, which were 24-pin versions of the 8 or 9-pin Okimate 10. I used one with my Amiga 1000 and one with my Atari 520ST. It was actually a thermal wax-transfer printer, not an impact dot-matrix printer, strictly speaking. Thanks for the update. I was lucky to be able to remember the make and model. Since it made pixelated printouts, I assumed it was a dot matrix printer. And I never used the proper thermal paper I guess. I was a pretty poor high schooler when I had it and just used the cheap tractor feed paper that I could scrounge from school or my dad’s office. I remember when I updated to a 24 pin printer and was amazed at the difference in the quality of the output. That one was a B&W Panasonic (PX-something??). I used that one through college. Okimate-10 was also my first printer. Used it with Vic-20, then C-128. The ribbon was plastic with alternating bands of the primary colors. Each band was the width of a piece of paper. Was not very efficent – would go through the expensive printer cartridges quickly. Ours was one of the Star LC models, a single color dot matrix printer. Me and my brother used it with our Amiga 500. The good old Citizen 120D in all it’s screeching glory and with a removable ROM board to convert it from parallel to C64 serial. And now I have a cheapo Samsung ML laser printer that cost less than half the price of my LC-200. My first printer was a teletype. Large and impending, it stood in the corner of the computer room, and it would bang out the listings of my first rudimentary programs. I have no idea of the brand, but even to my young eyes this thing had to have been an antique. It had a heavy stand that supported the thing and cylindical keys of beige that inserted into round cut outs in it’s gray metal body. It was a hacker and would turn out page after page of text, risque ASCII art (“Kathy”, most memorably. She had me by line 54), and text adventure transcripts, so that I could remember what I had done, and re-map if necessary. I remember re-inking the ribbons as some point, under tutelage from my technician uncle. Most notably, I remember how quiet and fast the C. Itoh 8510A dot matrix printer was in comparison. It was the equivalent of Apple’s AM20058 printer in every regard except the Apple branding. I can’t believe I thought of the dot matrix as quiet! And Kathy never looked so good! How I ever found and printed her out and never got busted with all that racket, I’ll never know. I have a Commodore DPS-1101 daisy wheel printer that I’d really like to fire up again to hear that rat a tat tat clackety clack sound it used to make as it wobbled the desk into pieces. I also remember having a Star LC-10 Colour printer hooked up to either my Amiga or 64, or maybe both. My first printer was the Commodore 1520 Printer/Plotter and was paired with my VIC-20. The printer was unique since it used 4 ball-point pens to draw/plot onto wide receipt paper in either black, red, green or blue. It had a number of built in features such as selectable text sizes, rotation of text and color selection. It could of course also plot graphics. Screen graphics were nearly impossible to print– things from programs like LOGO worked the best. These printers now currently suffer from two bad gears that drive both the print head and the paper roll. Without these gears, the printers just “stutter” in place. I’ve since figured out how to repair them with some glue. I blogged about the repair process some time ago here. The pens are a rare find. All that I have are NOS or old ones that were securely capped. I think there’s an outfit in Germany that claims to have exact replacement– at a cost. This printer is mesmerizing to watch as it draws text. My first printer (A4 that is, I do not count the tiny FP-10 printer which accompanied my Casio FX-602 calculator, which REALLY was my very first printer) happened to be an HP LaserJet Series II, which I still own, after almost a quarter of a century of loyal service. I had to repair it twice, and another feed roller replacement is in order, but it still impresses me with its quality and attention to detail. I bought it new using an HP employee discount granted to me by a friend, but it still was a huge amount of money for me at the time, being a student with tight income. I am determined to use this printer until the end of my life, and if I manage to find suitable toner cartridges for the next 40 years or so, I’m sure the trusty LaserJet will cope. I wanted to replace it by a color printer, but ever since HP abandoned the 4550, I see no worthy replacement and simply gave up on the idea. My first printer was a Commodore MPS-801, which I wish I had kept. It was loud and obnoxious but printed out many stacks of program code. The first printer I actually owned would be an HP OfficeJet (circa 1996 and a POS). Up until then I just used printers at school and work (and the parents). My first printing experience has to be in 1983. Our high school was outfitted with Apple ][+s and IIRC Epson 80 printers. Around 1984 my parents brought home this beastly all-in-one (http://www.historycorner.de/Coco2/OkiiF800.html). Since it lacked compatibility with my Apple ][ diskettes I rarely used it. In 1985 I started working for a local manufacturing firm as their in-house MRP/ERP programmer. All reports (and code) were printed on AT&T M40 band printers. I loved those printers–giant blue boxes with 132 column green bar pin feed paper (the pin feed holes were NOT detachable). And the noise they made was awesome. I miss that sound. At night we would reverse the paper (white side) and print out door size ASCII art. I would estimate that I printed more pages on the M40s in my 6 years of working there than all the printers I’ve every used since 1983. Much of that has to do with the need to print less starting in the 90’s. But I do miss printing out my code on green bar paper and debugging with pen and paper. The first printer I used was an Epson MX-100 connected to my father’s IBM PC. 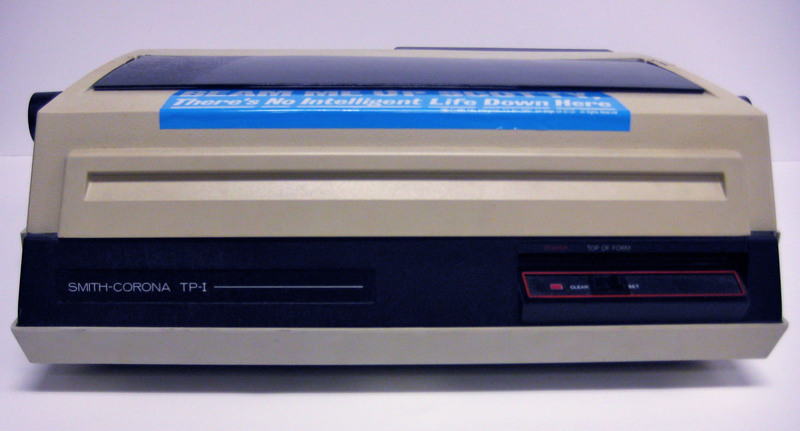 The first printe rI owned was the IBM PC Compact Printer (the PCjr thermal printer), connected to my PCjr. Wow, interesting looking printer. I’m too young to even have heard of any these, outside retro computing websites on the internet. The first one I ever used was a Canon Bubblejet-100 ( one of these -> http://www.112ink.co.uk/simg/i2_printers/CANON/BJ100.jpg) that only had black ink and in retrospect was pretty slow by modern standards. I had that burn the image into the paper one for the spectrum. Had lots of fun with it. My first was the Alphacom 81 thermal printer. It came with an intelligent interface for the TI-99. My friends in Oregon back in the 80s used either the TP-I or TP-II not sure which, but they got the tractor feed option which was available for it. They were using Atari computers and the Paperclip WP program to collaborate on a book. That book never was published, but one of them later did produce some works that got published using the Atari/Paperclip setup but a Citizen Premier 35 printer that was much faster, and nicer in some other important ways. I was the engineer that developed this printer. This was my baby. This was based on the Typetronic electronic office typewriter. It was obvious to all of the R&D engineers at Smith Corona that there was an incredible need for a low cost high print quality printer. The problem was that management did not see home computers as a market that would ever grow. Despite this, I developed a prototype. I used a Mostek 3870 microcontroller to create an interface to the existing Tpetronic circuit board. It took data from the parallel interface and emulated the keyboard on the typewriter. Management was still not interested. Then by some miracle, some space opened up in the factory in Cortland NY. They had planned another product that was cancelled, so they thought they would give this printer a try. They took out a few ads in Byte magazine, and soon were swamped with orders. They could not keep up. In the end they decided to concentrate on their “core business” – typewriters. We could not convince them that typewriters would disappear. We also had developed a home computer (similar to the Tandy Color Computer) that was never manufactured. They were not interested. By 1982 after three bad quarters, they closed the R&D center in Newtown CT, and I was looking for a new job. Wholly off-topic, but I still have a sizable collection of Smith-Corona typewriters. Mine are all mechanical, though; I did have one electric model from what I believe was the late-60s, but I was never much of a fan of _electronic_ typewriters. I _do_ remember my mom using a Smith-Corona daisywheel typewriter in the late 80s or very early 90s, though, which let you type a line on an LCD display before hitting return so it printed that line while you typed the next one. Several of the printers mentioned here—Okimate, Star, Apple ImageWriter—were ones I always wanted to buy while looking through the pages of BYTE or Compute, but never could afford. Even when we had a computer in the early 90s, we saved files to a floppy and took them over to a friend’s office at Purdue to print them out. The first printer I actually owned was an Epson Stylus Color 8 Cube: https://www.epson.com/cgi-bin/Store/support/supDetail.jsp?infoType=FAQs&oid=14394&prodoid=98330_2, to match my original iMac circa 1998. The first printer I actually OWNED was a Diablo 630, but before that I had used Teletypes and various nine pin dot matrix printers a lot. I never used the Diablo very much and wound up buying a used Apple LaserWriter IINTX on the strength of Don Lancaster’s writings. It lasted me almost fifteen years. I don’t even have a printer any more, I print at FedEx Office on the two or three times a year I print these days. Around the time I developed the TP-1 printer, I had interfaced an old military surplus Teletype model 15 printer to my Ohio Scientific Superboard computer. This is a Baudot 5 bit code printer. I also had to write a driver that translated the 7 bit ASCII to 5 bit Baudot . Because you only get 32 combinations with 5 bits, the printer uses upper case characters only, and it had a “shift up” and a “shift down” characters that worked like a typewriter to give you 64 combinations total, enough characters for a teleprinter. These are the printers that you used to see in newsrooms, that gave that teletype sound. The chassis is made out of cast iron. These were made from 1930 to 1963. This thing is a brute. This printer prints at 6.5 characters/sec The interface was serial current loop at 45.5 bits/sec. There is no electronics of any kind in the printer. The serial UART is mechanical. I still have this machine in the basement.